When I was trying to come up with recipes for our Anniversary dinner (read a little about it HERE) I knew for sure I wanted to make these. I had saved a screen shot of this recipe from Martha Stewart Living way back in March of last year and knew it would be perfect for our “tailgate theme”. 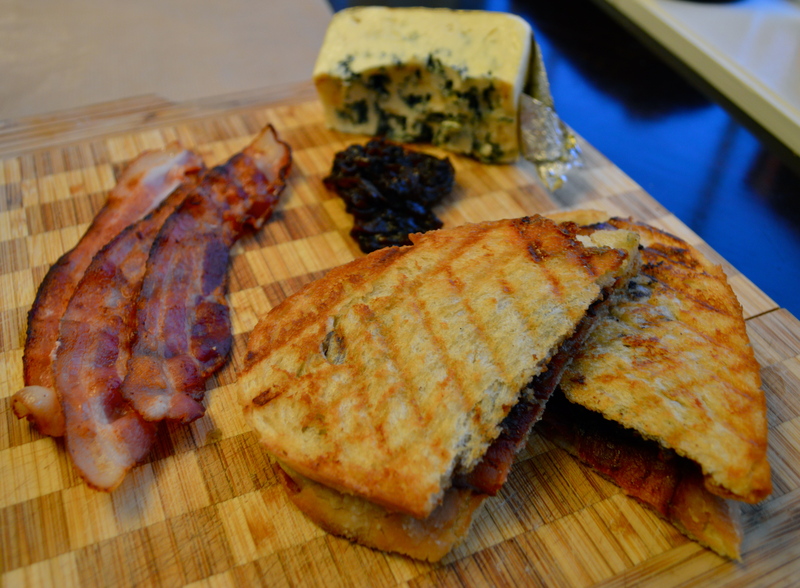 Since the sandwich was crazy simple (just your basic panini with bacon and blue cheese) I decided to make my own sweet onion jam instead of buying it since it’s really the only ingredient you can make from scratch. It was incredibly easy (basically the start to french onion soup with a little balsamic vinegar) and really made the sandwich! Out of everything I made for the dinner, this was both of our favorite and the fact that it’s so easy makes it even better! You can make the onion jam up to a week ahead of time and just store it in an airtight container in the refrigerator. Spray a skillet with a non-stick spray and set over medium heat. Add 3 large spanish onions that have been peeled and cut into half-moon slices (1). Cover the skillet and cook, stirring occasionally until the onions are softened and translucent, about 15 minutes. Sprinkle the onions with 2 tbsp sugar (2) and stir, then recover and cook (stirring occasionally) until the onions are a deep golden brown, about 20-30 minutes (3). Add 1/4 cup water and stir to dislodge any brown bits then cover and cook for 20-30 minutes more until the onions are a dark brown (4). Add in 2 tbsp balsamic vinegar and another 1/4 cup water and continue cooking a few minutes more until the liquid has been absorbed (5). When you’re ready to make the paninis, pan fry thick cut bacon slices and let drain on paper towels. 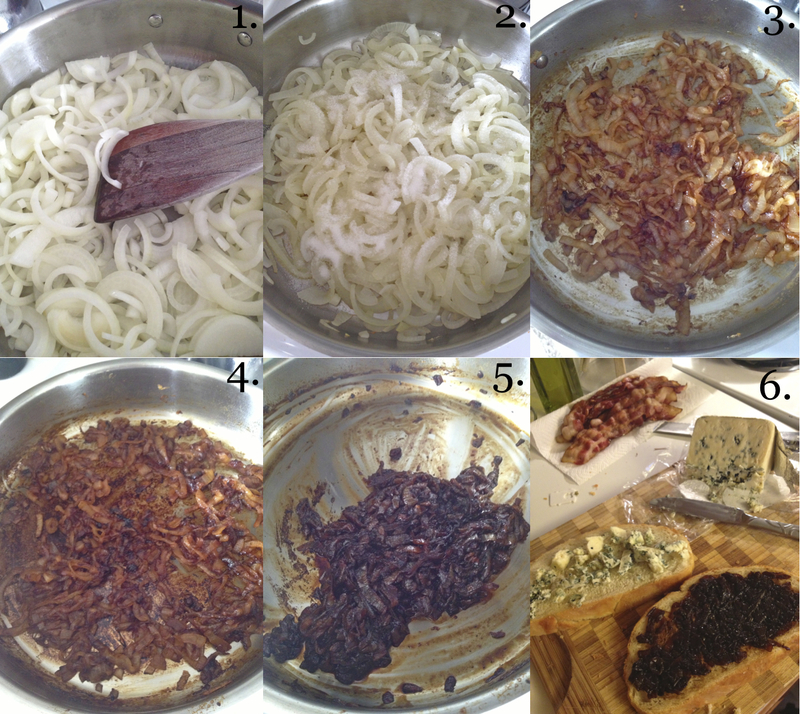 Butter one side of two crusty pieces of bread with unsalted butter, spread one unbuttered side with the onion jam and the other with blue cheese (I used gorgonzola because that’s our favorite) (6). Place one buttered side of a piece of bread on your panini maker, top with a few slices of bacon and put the other slice of bread (buttered side up) on top of that. Cook until crisp and brown, then slice in half and serve!